Tom Keneally, winner of the 1982 Booker Prize with Schindler’s Ark, which was later adapted into the Oscar-winning film Schindler’s List, here joins forces with his eldest daughter, Meg, a journalist, in the first of a new historical crime series set in nineteenth-century Australia. The simmering tensions in a British penal colony ratchet up with the mysterious death of the commandant’s beautiful young wife. Who could have murdered the sweet-natured Honora? It is 1825, and Hugh Llewellyn Monsarrat finds himself working as a clerk to Major Shelbourne, the commandant of Port Macquarie penal colony which is situated down the coast from Sydney. Monsarrat was sentenced to be transported from England to Australia for fraud – he had been pretending to be a barrister – but his talents as a clerk mean he has mostly avoided the back-breaking work to which most convicts are subjected. Monsarrat is a fascinating character and in flashbacks the Keneallys slowly reveal his life before transportation. He is educated but poor, and has a restless streak that leads him into the kind of risky behaviour resulting in his sentence. He knows he is lucky to be in the privileged position of clerk to the major. Monsarrat’s only real friend in Port Macquarie is Mrs Mulrooney, who is housekeeper to Major Shelbourne and devoted to his wife, Honora Shelbourne. Each morning before taking up his pen, he visits Mrs Mulrooney’s kitchen for a cup of tea and lively conversation. Mrs Mulrooney was also transported but she has earned her ‘ticket’, meaning she cannot leave Australia but is considered a free woman within its confines. She is an illiterate Irish woman but her mind is sharp and her observations are keen. When Honora sickens and dies, Captain Diamond, a nasty and vicious man, arrests Mrs Mulrooney on a charge of murder. Monsarrat tries to find a way to exonerate his friend but Captain Diamond is hell-bent on hanging the woman. Monsarrat uncovers the identity of the murderer but can he bring the person to justice before Mrs Mulrooney is executed? The novel’s extensive but never intrusive historical detail brings the penal colony to life, and contacts with the Birpai, the local Aboriginal people, demonstrate how arrogant Europeans took their lands without a second thought. The mix of people living in the colony is also interesting. There are professional British soldiers, men and women who had earned their tickets, special convicts like Monsarrat whose talents afforded them certain privileges, and ordinary convicts who toil in work gangs until infection or exhaustion kills them. As a person could be transported for the most menial of crimes, it was a cruel and brutal form of punishment. Daily life is well depicted, with each person in Port Macquarie knowing their role in the running of the colony. The descriptions of the flora and fauna of nineteenth-century Australia also root the story in a very particular time and place. It is beautiful, but for many it is a prison nonetheless. 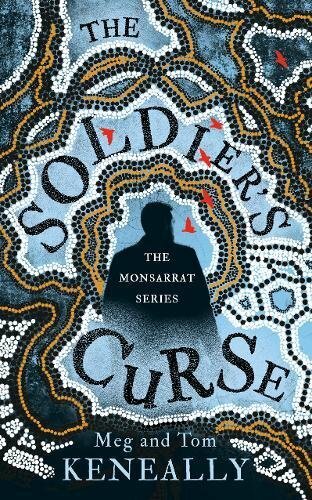 The Solder’s Curse is an absorbing tale with a very likeable hero in Monsarrat. That the Keneallys are planning to feature him in further adventures is very good news indeed.